It’s day two of our Civil War children’s clothing week. 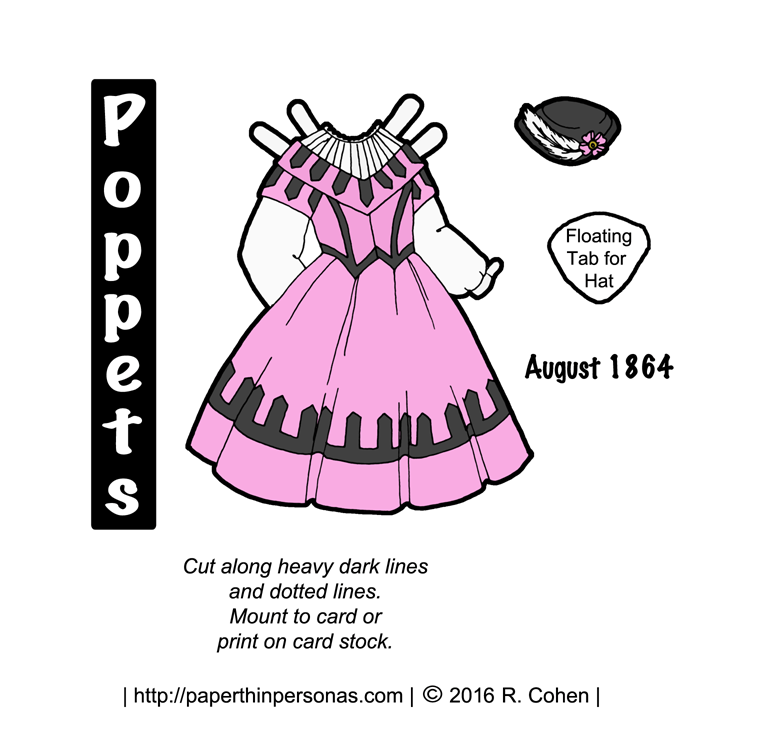 Today’s paper doll dress is a mix of two dresses from the 1860s. A fashion plate from August 1864 inspired the dress design. The color scheme is from a different fashion plate from June 1865. The pink and black combination from that fashion plate was so contemporary that I wanted to use it. I think it is easy to forget how bold the Victorians could be. This dress would have been in several parts. It’s not clear from the illustration, but I think the bodice and skirt are meant to be separate pieces. Underneath the bodice, a guimpe is worn. While It is also possible that the bodice and skirt connect, like a jumper, that is not how adult women’s dresses in this era were made. The dress design comes from this fashion plate. If you’ve never heard the word guimpe before, don’t fret. It’s not a word that gets tossed around in most conversations. A guimpe was a high necked blouse-like garment women and children wore underneath a low-necked dress. Think of it like like a dickie or a camisole today. A guimpe was never supposed to be seen without a something over it. Some weren’t even complete blouses, but were just dickies and matching sleeves. Part of the appeal of the guimpe, I suspect, was that washing it was more easy than washing the entire dress. The color scheme comes from this fashion plate. Both of the inspirational fashion plates come from the same publication Magasin des Demoiselles. This French fashion magazine in the 19th century was very popular. Many of the 1860s plates from Magasin des Demoiselles include children, along with the ladies. It’s a great resource for what the fashionable girl, or, more rarely, boy, would have worn while running about and being a kid. Not that running around being a kid was really condoned too much in this era. Both fashion plates are from the Casey Fashion Plate index which is an excellent resource for 19th century fashion plates. So, what do you think of my pink and black color scheme? Too bold for the era or okay? I always love to know what you think. Love the blog? Consider supporting it by becoming a Patron, every dollar is lovely.